Water-Cooled Process Chillers | Legacy Chiller Systems, Inc.
Water-Cooled Chiller with Integrated (Closed) SS Thermal Storage Tank. Water-cooled fluid process chillers remove heat from your process and reject heat to a water source. This water source is generally a cooling tower mounted outside that is sold separately. Although not as common as its Air-Cooled chiller counterpart, for many larger industrial process applications, that have an on-site cooling tower system, water-cooled process chillers can be a great fit. Water-cooled chillers are generally available in a package (unitary) configuration and tend to be very efficient on space. 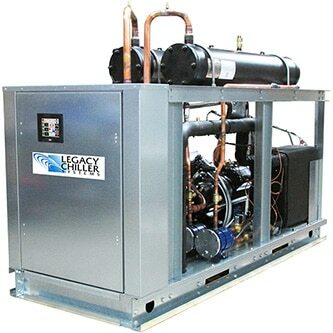 Legacy Chiller Systems manufactures three product lines of water-cooled process chillers designed to meet any fluid cooling operating environment from 1-100 tons of cooling. Package Chiller System: This term highlights that all of the chillers internal components are located inside a single unitary cabinet. 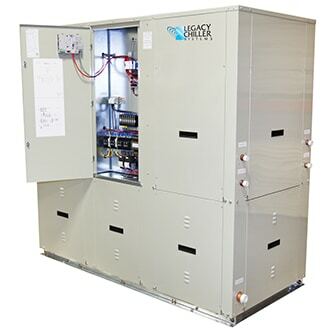 By far, package chillers are the most common as they are both cost effective and easy to install. 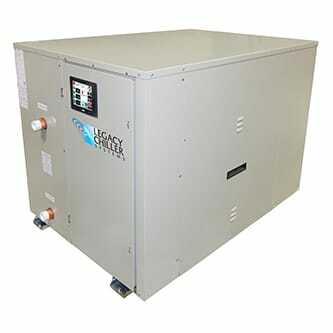 Legacy manufactures several different product lines in the Package Water-cooled configuration. These product lines are PZW, PZWT and PSW product lines.